7.8 Earthquake hits the Iran-Pakistan border region. Initial reports: At least 15 people were killed and several others injured in the Panjgur and Mashkeel areas of Balochistan. Around 50 people sustained injuries in Karachi in incidents of roof collapse. Over 1,000 houses were partially damaged in Balochistan. An Iranian government official said he expected hundreds of deaths from the earthquake. “It was the biggest earthquake in Iran in 40 years and we are expecting hundreds of dead,” said the official, who spoke on condition of anonymity. 5.3 Earthquake hits Arunachal Pradesh, India. Dust storm in Chhattisgarh, India has claimed the lives of at least six people. Storm injured around 25 people and damaged more than 150 houses. Train services were also affected. Imelda continues to approach Mauritius and remains a threat to the islands. Winds of 120Km/h have been recorded at Rodrigues Island. Cyclone Warning for Rodrigues is level four. At least four skiers have died in weekend avalanches in the French Alps. Three died in an avalanche in Dent Parrachee mountains in the Savoie region and one other died in an avalanche in Champsaur. An avalanche in Kashmir, India has claimed the lives of at least three people. 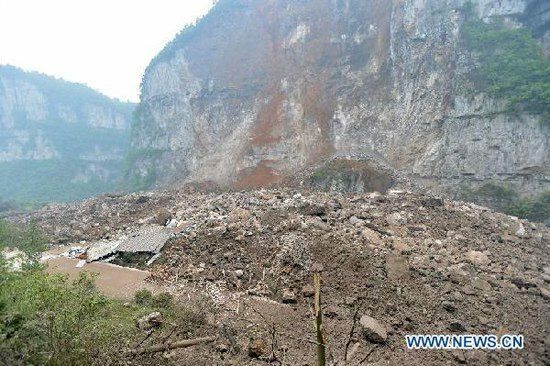 A landslide has damaged more than 80 meters of the highway in Longchang Town, Kaili City in Guizhou Province of China. As of 15 April 2013 (18:00 CET), the National Health and Family Planning Commission notified WHO of an additional nine laboratory-confirmed cases of human infection with influenza A(H7N9) virus. Of the latest laboratory confirmed cases, four are from Zhejiang, three are from Shanghai and two from Jiangsu. A team of international experts have arrived in China to assist with the spreading outbreak. Bagana (Bougainville Island, Papua New Guinea): Activity at the volcano continues. A volcanic ash plume was observed at 6,000 ft (1.8 km) altitude and extending 15 nautical miles to the S and W.
White Island (New Zealand): Tremor remains unstable. After a period of low intensity, strong tremor has reappeared today, reflecting internal fluid movements and degassing. Popocatépetl (Central Mexico): Another, but weaker episode of strong volcanic tremor and near-continuous emissions occurred yesterday at 15:50 (local time), creating a plume of steam, gas and ash rising 900 m and drifting NE. After a few hours, activity decreased again to individual small explosions at a rate of about 1 per hour, such as one captured on the webcam a few minutes ago. Telica (Nicaragua): The earthquake swarm continues with little changes. Masaya (Nicaragua): Seismic activity is unstable, with a phase of weak tremor (and a regional earthquake) visible on this morning’s seismogram. Nevado del Ruiz (Colombia): The earthquake swarm with weak volcanic tremor continues, associated with internal fluid movements and steam and ash venting, creating a plume observed rising 630 m above the volcano this morning. The volcano-tectonic earthquakes , i.e. the likely location of new intruding magma, are located in northwest of Arenas crater, at an average depth of 7 km. The largest recorded quake was a magnitude 2.6 event at 22:43 (local time) last night, felt by officials of the Colombia National Parks in the area of Brisas. For sheep and beef farms, the average profit will be more than halved and the impact of the drought will linger for another year or two as farmers cull breeding stock this year at cheap prices, but will probably face higher costs to replace stock next year. More than 20 million people in China are affected by a drought in the country’s south-west. The 2013 drought season is off to a worse start than in 2012 or 2011. It’s a good indicator, based on historical records, that the entire year will be drier than last year, even if spring and summer rainfall and temperatures remain the same.